Re-tiqued by Rae Bond: A New Topcoat Technique and a Lottery win! I won the lottery today! It is great timing because Mr. Chuckles and I are about to take off for sunny Cuba in a week's time. Sure, I only won $26, but hey, that will pay for the cost of the spray tan I will get before we go. Yes, I get spray tans...not that often, as I find my life isn't exciting enough to need 'tan' skin on a regular basis. But, I do like to get them before I head off on a vacation to a sunny destination when I have been covered up in layers of clothes for the past five months. I find with the spray tan I am not in such a hurry to play catch-up on my tan in the first two days of being on vacation (which inevitably results in a really bad burn). By the time the spray tan wears off I am usually starting to get a bit of a natural glow. 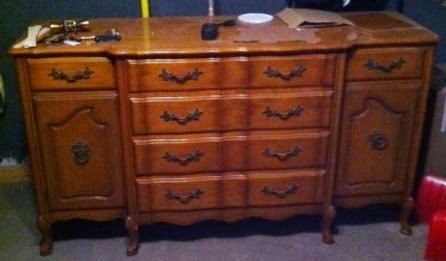 Speaking of top coats, I used a new technique on this piece, which I must say, is an absolutely stunning piece of furniture! It is so grand, and was surprisingly manufactured right here in my very own city. It stands at 36" tall and is 20" deep. Most of my 9 drawers stand at 36" - but only after I custom add legs to them! Prior to that they are a dwarfy 31". I like a short stature on MCM pieces, but on the chunky 70s dressers I find they look way better with extra height. Personal preference I suppose. But obviously this amazon didn't need extra height because she was already so tall! I went to pick her up and realized there was a very good chance she wouldn't fit in the Mazda 3, the gentleman enquired where I live, and by sheer good fortune he was heading to my very street later that same afternoon for a birthday party! Pretty coincidental in a city of 500,000 people! So he actually brought her to me. Very kind. The least fun part was the sanding. Sanding French provincial furniture is the most labor intensive out of all furniture. So many god darn curves and bevels and lips and ledges. Urgh. It took about two hours to sand her down, vacuum and wipe her clean. Next step was to prime her up with some tinted primer. Two coats and a bunch of dry time later I was ready to paint.= (aka the fun part). Oh, and the hardware was giving a dose of Rub-n-Buff in antique gold. I remembered reading in a wood working forum that someone found that tung oil finish gave a less streaky result than WOP. I just happened to have a can on the shelf in the basement so I thought Id give it a whirl. I used an old rag to wipe it on, and then I used a second rag to virtually wipe it all back off, just leaving a tiny hint of the product, but enough to give me the subtle sheen that I wanted. It took quite a long time to fully dry (despite me wiping almost all of the product back off), but in the end it produced a more high-end result than if I had just left the paint un-topcoated. Anyways, I am really happy and I think I will try this technique on another piece in the future. But for now I would recommend it, particularly on a darkly painted piece of furniture as tung oil finish will amber over time (so DON"T use it on a light coloured piece). This piece is truly stunning! I love that deep blue with the gold! Stunning! I love Oil rubbed into paint for a beautiful sheen. The colour you have chosen is fabulous on this piece. Oh my goodness I'm in love with that fabulous shade of blue,...stunning! Gorgeous Rae! I'm doing a frenchie, very similar to yours, in a killer violet/cobalt mix w/some sapphire metallic as the final coat. Speaking of your tung oil, I was researching a finish I could use for a front door that was painted with chalk paint. It's out of direct sun and weather, so I wasn't worried about something really heavy. Anyway, found a mixture that the guys on the woodworking site use. 1/3 each of tung oil (BLO), mineral spirits and marine varnish. (I used Helmsman outdoor spar varnish). Spar varnish already has the oil in to give it the flexibility outdoor wood needs. you can use the satin, or glossy, doesn't matter. Oh and it's a wipe on!! No brush marks. Overtime the tung oil will harden and fill in the pores of the wood. You can play w/the oil to varnish ratio, depending on how hard a finish you want. Any who, try out on something and let me know how you like it. I think it's dynamite over milk paint and chalk paint, and a satin enamel paint too.